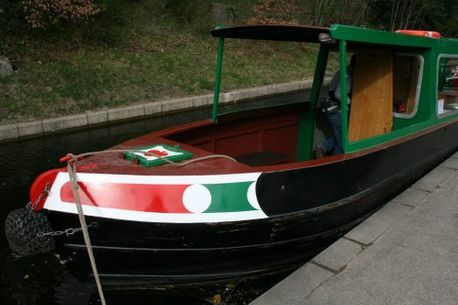 Our 32-foot (11m) narrowboat is also available for day hire. This is the perfect way for a family, group of friends or a corporate team to have their own private boat for the day and soak up everything that this picturesque World Heritage Site has to offer. This option is self-steer only, but don't worry, we’re confident that you can do it and steering tuition is provided on arrival. The boat accommodates a maximum of 10 passengers and is comfortably fitted out with heating, hot and cold running water and a flushing toilet. There are gas rings for cooking as well as crockery and utensils, allowing you to enjoy anything from a few snacks to a hearty lunch whilst drifting along the peaceful Llangollen Canal. Hiring the boat between 9:30am and 5pm gives plenty of time for a leisurely cruise along this beautiful waterway and an unforgettable passage across the famous aqueduct at Pontcysyllte. Your turn-around point is the lift bridge after the aqueduct – a round trip of about 10 miles. See this majestic site from your very own narrowboat. We’ve put together a folder detailing all of the pubs and restaurants along the way, together with their telephone numbers and menus should you wish to book ahead. All of our day boat hires are private charters. However, if you’d rather have a professional on board, you can hire a skipper to steer the boat for you by prior arrangement. This costs just £80 for the day and allows you to sit back and relax throughout the journey. We provide everything you need for a relaxing day on calm waters.